Maaza Mengiste is a novelist and an essayist whose fiction and nonfiction examine the individual lives at stake during migration, war, and exile, and consider the intersections of art and violence. From my table next to a large window inside a café, I watch the young man. The orange glow of a late afternoon sun drapes him in thick layers, lying across his shoulders and accenting his face. I recognize him for the East African that he is, a young man of Eritrean or Ethiopian origin with a slender frame, delicate features, and large eyes. He has the gaunt look of other recently arrived immigrants whom I have met, a thinness that goes beyond a natural state of the body. He moves differently from one accustomed to the space he inhabits; his gait is a series of cautious, jagged steps forward. He appears frightened, overly sensitive to those who brush past him. He seems as if he is trying to coil inside himself, shrink enough to avoid being touched. Maaza Mengiste is a novelist and an essayist. Her fiction and nonfiction examine the individual lives at stake during migration, war, and exile, and consider the intersections of art and violence. 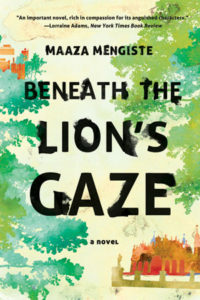 Her debut novel, Beneath the Lion’s Gaze, is set during the 1974 Ethiopian revolution that deposed Emperor Haile Selassie. It was selected by The Guardian as one of the 10 best contemporary African books, and has been translated into several languages. Mengiste is a 2018 recipient of a National Endowment for the Arts fellowship, and was named a Fulbright Scholar, a 2013 Puterbaugh Fellow, and a Runner-up for the 2011 Dayton Literary Peace Prize. She serves on the advisory boards of Warscapes and Words Without Borders. Her work can be found in The New Yorker, Granta, The Guardian, the New York Times, Rolling Stone, Guernica, and BBC. She was a writer on the documentary projects, Girl Rising and The Invisible City: Kakuma. Her second novel, The Shadow King, is forthcoming from W.W. Norton. Mengiste teaches in the MFA Program in Creative Writing at Queens College, City University of New York, and is a lecturer in Creative Writing at the Lewis Center for the Arts at Princeton University.